Under desk ellipticals will get you up and moving throughout the workday. We’ve found the best models that can burn extra calories and improve your overall health at work. So read on for our top picks in the review matrix and a handy buying guide to learn more about key features, price ranges, and the pros/cons of each model. Our top choice for its plethora of useful features like Bluetooth connectivity. Comes with a great collection of all-around features in a small package. A fantastic value pick with an expansive set of features that puts it ahead of its price point. A design that’s sleeker and lighter than most makes this a great pick if portability is important. A sturdy design, great stability, and high adjustability make this a machine that’ll last. Syncs to its own smartphone app and many other popular fitness apps. The design allows you to sit or stand. Comes with a sturdy handle for moving and storing the machine. Features reversible pedals and vibrant color options, along with an attractive price point without sacrificing features. Sports a detachable monitor, allowing you to track your progress effortlessly from your desktop. Stylish color options and transportation wheels for moving around the home or office. Not designed to be used while standing. Has a higher price than most models. This product’s design is a little clunky. The size of the display is below average. Doesn’t have a built-in handle, which may make transportation and portability more difficult. May be less stable and durable than other models because of its lightweight and narrow profile. On the higher end of the size and weight spectrums. Moving it can be awkward. Why Buy an Under the Desk Elliptical? Increased calorie burn. Work and burn calories? Oh yes. Research has shown that using a mini elliptical increase your calorie burn by 120% compared to sitting. This is a great way to boost your fitness efficiency during slow times in your day. Stay active all day long. Exercising before or after work may be the norm, but you can do better. These machines allow you to stay active whenever you want throughout the workday. Convenience. Get a quick workout whenever and wherever you need. Small and portable, these little machines are easy to move between the home and office. Low-impact exercise. Stop feeling the unnecessary pain. Some cardio exercises are tough on your joints. The low-impact nature of these machines takes it easy on your knees, ankles, and hips, creating a low-risk, efficient exercise. Natural motion. The elliptical pedal path is a natural movement for the legs and feet. Better for your body, this creates a fluid exercise with smooth, efficient movements. A versatile workout. You can do more than give your legs a workout. Exercises on these machines work muscles and up the heart rate. It can affect both the lower body and upper core, creating a truly balanced workout. $60-$150: The most popular price point with simple machines and features. You’ll get either the machine alone or an additional visual monitor to track your progress. Durability, materials, and options vary. 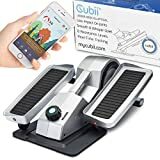 $150+: The range with more bells and whistles like Bluetooth connectivity and included elliptical mats. Better designs with more ergonomics and customizability are common. Under desk ellipticals are simple machines and don’t have the advanced features treadmills or normal ellipticals might. That doesn’t mean they’re lacking though. Check out these features that are common in some of the best mini ellipticals. Do you want to sit or stand while using the elliptical? You can only sit and use some mini ellipticals, but if you want versatility, others allow you to stand as well. These options have large pedals and a stable base to keep you on your feet. The elliptical’s tension determines the resistance of the workout. 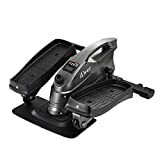 Most options include a hand crank or a foot shifter to adjust tension, making pedaling easier or more taxing. This helps you stay more focused on cardio or muscle development. The pedals are the most instrumental part to get a great workout. It’s important to consider aspects like shape, size, and reversibility. Make sure the design fits your feet comfortably. Some high-end machines will come with Bluetooth to track progress on your smartphone. This is a useful feature if you’re looking to sync your data with other fitness apps or just keep track of your fitness progress in a convenient place. These are the brains that control all of the different settings in many machines. Visual feedback will show your progress, keep you motivated, and help you stay on top of your fitness goals throughout the day. These are smaller than regular elliptical controllers. Certain features and add-ons will increase the portability and stability of your machine. These include handles, non-slip mats, and wheel-stoppers to keep your office chair from drifting while you exercise. Your exercise environment: Measure your exercise space to make sure your machine will fit comfortably. To avoid your coworker’s wrath, factor in the noise level of the machine. Take note of the desk height too; most ellipticals require 25 inches of room between the pedals and the bottom of the desk. Pedal height: Your legs need room to move. The pedal height affects the clearance between your knees and the desk, which influences overall comfort. Pedal angle: The angle of the pedals at the resting/flexing points influence comfort and fit. The pedals should position your feet at natural, comfortable angles in relation to your legs. Quality and portability: For maximum portability, you should look at machines that are 30 pounds or less, preferably with a handle or grip to move around easily. However, machines that weigh less (15-20 pounds or less) may use lighter, less durable materials. The best mini ellipticals have a sturdy design regardless of the weight. If you’re looking for a solid under desk elliptical jam-packed with unique features and options, this is the best pick. It’s the only one on our list that comes Bluetooth enabled for smartphone connectivity, making every day tracking simple through its native app and other options like Fitbit and Apple’s HealthKit. It also comes with some stylish color options. The wood-grain Moku color, for example, is unique and stunning for a higher price. The ergonomic pedal angles also offer less impact on the joints. One drawback of a premium product like this is the price. The advanced features and different color options increase the price. So, don’t be afraid when you see it soar past others on this list if you want the fully-featured options. Our wallet-friendly pick comes with a sleek, athletic look that’ll make you want to use it every day. It comes with everything you’d expect from the best under desk ellipticals and is highly versatile with sitting/standing and reverse-pedaling capabilities. Unlike other budget options, the Stamina In-Motion comes with an easy-to-read monitor. The adjustable tension knob, while not quite as convenient as a foot shifter, makes it easy to customize your workouts. One minor inconvenience you may experience with this machine is the lack of a built-in handle. Transportation may require a bit more effort, but the 24-pound frame means you won’t feel like you’re dragging your entire gym around. This is a good pick at a great price, especially if you want to use it at home or in a larger office space. Prepare to get a great workout without disturbing your coworker’s thanks to its quiet operation. This one comes with many standard features, a sturdy design, and a solid handle for portability. It’s also the most adaptable and spacious for sit-and-stand use. If getting out of the chair during the workday is important to you, this could be a great selection. These features come with one major drawback: a bulky design. The higher profile and extra mass make it harder to fit into small offices or under desks with limited clearance between the floor and top. The sleekest mini elliptical on this list with a low profile. The detachable monitor is a handy feature that allows you to monitor your progress directly from your desktop. 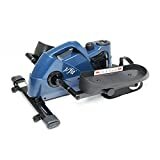 The foot shifter makes adjusting the tension super easy when you want to change the workout difficulty during a workout. Best of all, the FitDesk has some of the lowest pedals on the market for small workspaces. A trade-off for this light, a sleek machine is the possible loss of some stability. A non-slip floor mat is pretty much required for this one. The machine’s lightweight frame can lead to unwanted shifting. It can also have issues with intermittent squeaking and stiffness. A budget-friendly price and a solid set of standard features like a sturdy, narrow design, and a built-in handle give this elliptical a lot of value. Like our Best Value pick, the IDEER Life is a great option if you’re new to ellipticals or office workouts. The pedals have a nice, unique texture to them for increased grip. Compared to other models, the built-in monitor also has more tracking features you can use to stay up on your fitness progress anytime you want. A wide variety of color choices and the option to arrive fully assembled are major benefits if you’re looking for a machine that stands out without a lot of work. This, however, comes at the cost of greater bulk and weight. The monitor is also quite small and may require a little bit of effort to read. Use a low-tension setting for cardio and a high-tension setting for muscle conditioning. A non-slip mat is a useful add-on in almost any environment, especially on hardwood floors. Set goals for yourself in your office workouts. Use your machine’s monitor to track your progress. Q: Do under desk ellipticals offer a good workout? A: Of course! You can work and get a great workout at the same time. These machines get your heart rate up while conditioning the muscles throughout your lower body. Q: Are mini ellipticals loud/noisy? A: The good news is most brands design these machines with a quiet, shared office environment in mind. They usually whisper quiet. Some manufacturers consider noise more than others, so be sure to check product descriptions if it’s something you’re concerned about. Q: Do these machines give me the same type of workout as a standard elliptical? A: Yes! A mini elliptical you can stand on will offer an experience that’s close to a traditional elliptical workout. Standing engages more of the upper body and simulates the positioning of a standard elliptical, just without the handles. A sitting desk elliptical will give you the same cardio and most of the same muscle conditioning. Q: How tall does my desk need to be? A: Most models suggest a minimum desk height of 25 inches. It’s a good idea to measure your workstation to check how much space you have. Some products will include the specific space required for efficient and smooth use, so be sure to check product descriptions and owner manuals. Q: How can I adjust my elliptical for resistance or sitting/standing? A: Most machines will come with either a twist knob or a foot shifter for adjusting the pedal resistance. It’s always a good idea to consult your owner’s manual for the exact operating instructions. Check the manual for how to switch smoothly between sitting and standing, as doing this incorrectly can pose a safety hazard. Under desk ellipticals beat the usual workday drag by getting you up and moving in the office. The Cubii Pro has to be our overall pick because of what it brings to the table: a great design and smart features you don’t get anywhere else. But if you’re on a budget looking for a solid machine, the Stamina In-Motion is undoubtedly the top value pick. Agree? Disagree? Have experience training with under desk ellipticals? Let us know in the comments below!